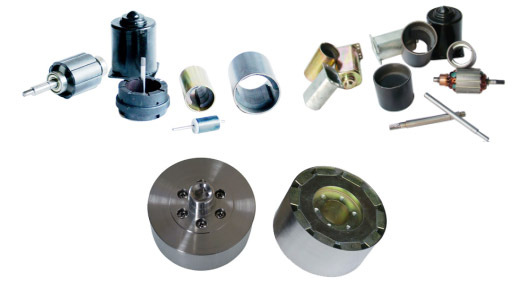 We supply pre-assembled motor parts with glued permanent magnets and metal body according to customers�requirements. In year 2001, our related factory started bonding arc segment type Ferrite magnet together with tubed steel housing to make electric motor stator for USA motor manufacturer. Today our magnetic assembly for motor industry covers stator and rotor what are assembled with hard ferrite magnet, NdFeB magnet, AlNiCo magnet, SmCo magnet, bonded NdFeB or bonded ferrite magnet. The assembling method includes glue bonding, incorporate injection, clipping and pinning. Adhesion test and flux distribution test on assembled stator or rotor, and endurance test, balance test, torque test, noisy test, comprehensive character test on assembled motor could be done at our completely equipped testing centre. Thanks to the technology support from complete motor manufacturer and accumulated expertise from practice, our products enjoy optimal quality control on adhesion, dynamic balance, noise reduction and other functional performance. We are sincerely looking forward to being a reliable sub-contractor of more motor manufacturers in the world. We can make after your drawing design.